Bloggers, are you having a difficult time deciding what to blog and when? The simple answer to your problems is to create an editorial calendar. There are lots of programs available online to help you with this, but if you're a pen and paper type, writing it out will help you get your ideas sorted out. 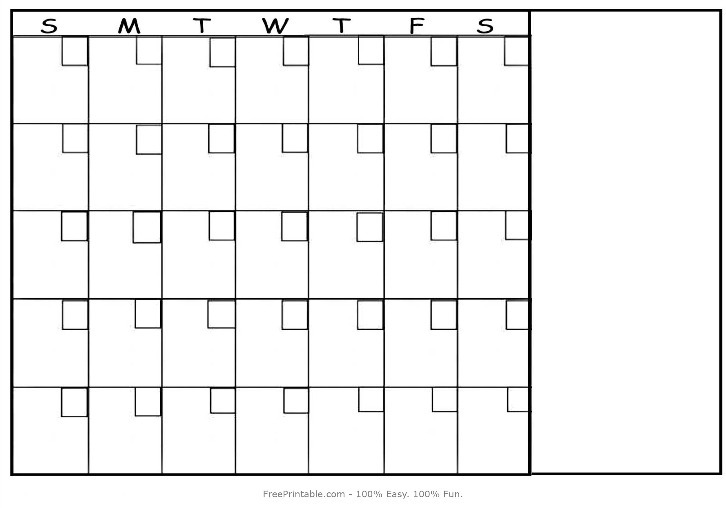 At FreePrintable.com, we know how frustrating it can be to nail down a blogging schedule. It's even more frustrating to try to figure out what to blog about. We're here to help. The first place you need to start is by looking at our free printable calendars. We have yearly, monthly, weekly and daily calendars available, but for planning out your blog posts, we recommend the monthly overview. Here are some tips for using our calendar to create an editorial calendar for your blog. Blogging requires serious effort, so the first question that you need to ask yourself before committing to blogging is how often realistically you can commit the time to write a post. No matter how frequently that is -- whether it's every day, three times a week or once a week, you need to be consistent in your efforts. Write your blogging frequency somewhere in the margin of your free printable blank calendar. After you've decided how frequently you want to post, we'll work on easy ways to determine your topics. Now comes the most difficult part: choosing your topics. One of the easiest ways to get a general idea of what you'll write about on any given day is to create a theme for each day of the week and put it on your free printable blank monthly calendar. This is especially helpful if you plan to blog daily. Tuesday Tip to write about any helpful tips you have for cleaning, organizing, designing, writing or whatever your hobby may be. Wordless Wednesday to post pictures of what's going on in your life. No words required! Thankful Thursday to list the things that you're thankful for. This is great for keeping a positive outlook during the week. Funny Friday to write about something funny that happened to you during the week. Sit Back and Relax Saturday to detail what you plan to do for the weekend. Sabbath Sunday to write about your faith, provide inspirational quotes or encourage others. Even if you don't have specifics nailed down, you can ease into your writing because you already have a general topic specified. Just write these themes into your calendar on the appropriate day. If you'd rather try another approach, take a look at some of your favorite blogs' editorials calendars. This may give you inspiration for your own each month.